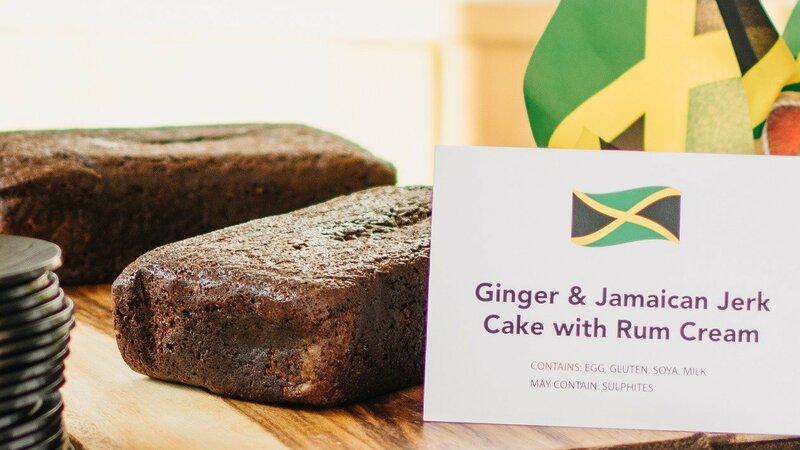 Add an extra bit of heat by adding in our KNORR Jerk Paste to this traditional ginger cake. Serve with a rum flavoured cream. Line 2 large loaf tins with greaseproof paper. In a pan melt the MEADOWLAND Professional 250g, brown sugar, syrup, KNORR Professional Ginger Puree, KNORR Jamaican Jerk Paste and treacle. Then with a stick blender blitz all the ingredients together until smooth then remove from the heat. Whisk the bicarbonate of soda with the milk then add in the eggs. Add the syrup mix from the pan and whisk into the eggs. Working quickly add the sifted flour and whisk until a smooth batter is formed. Pour the mix into the lined trays then bake for 40-45 minutes until the mixture springs back to the touch but still remains moist. Cut into 14 portions and serve warm. Add the MEADOWLAND Double, rum and icing sugar into a bowl then whisk until soft peaks are formed. Serve on the side of the cake.